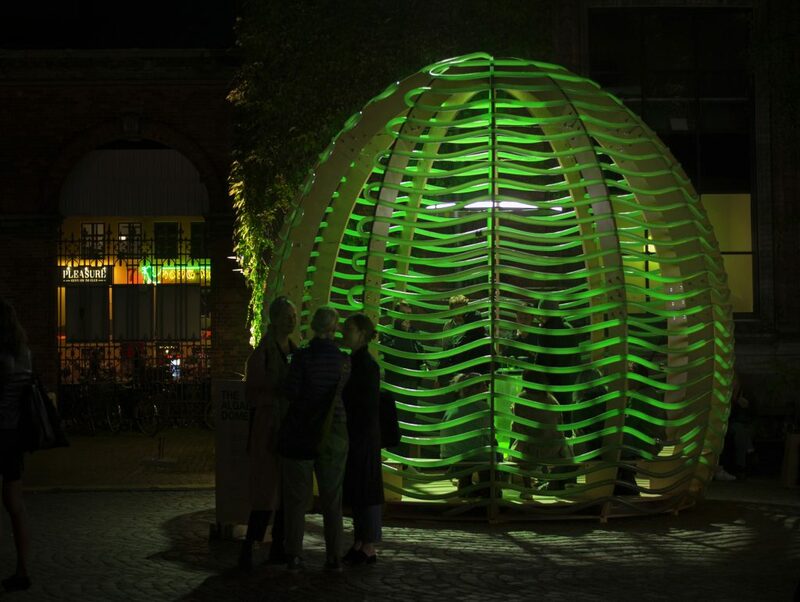 The Algae Dome Pavilion is a plywood prototype of a ‘closed system photo-bioreactor’ designed to produce biomass from nutrient-rich wastewater from livestock farms. It’s being used to grow the mineral, protein and vitamin rich micro-algae Spirulina, which contains more iron than spinach and more protein than meat. The Algae Dome Pavilion also showcases how the Earth’s self-regulating life support system can be integrated into our cities in the form of biomass circulating architecture that absorbs carbon dioxide and converts it to oxygen that is re-released back into the urban environment. Biomass production is also projected as a potential solution for the re-greening of deserts, the re-fertilisation of depleted soils and as a future replacement of existing crops, such as soya proteins, in animal feeds. Algae Dome was designed by three, sphere-genius architects; Aleksander Wadas, Anna Stempniewicz and Rafal Wroblewski in collaboration with Space10, a future living, research and innovation laboratory supported by Ikea. Space10, based in Copenhagen, works with artists and designers on research projects, prototypes, exhibitions, events and workshops. Check it out here. There are 50 shortlisted finalists in the 2018 Danish Design Award, organised by The Danish Design Centre. Winners will be announced on May 28. For more details follow the link.